When the DEA announced it had issued a s56 notice to EnviroServ to make representations as to why the DEA should not suspend or revoke its waste management license, the Upper Highway Air NPC, through its attorneys, requested an opportunity also to make representations to the DEA as to why the license should be revoked. Last week the DEA invited the NPC to Pretoria to make representations to it, and other government stakeholders, whom it had similarly invited to make representations. These included representatives from Ethekwini and the Provincial Department of Environmental Affairs. We thank the DEA for this opportunity and for the seriousness with which they are addressing the matter. Yesterday, the NPC was afforded just over 2 hours to make representations, after EnviroServ had finished making their representations. These were subsequent time slots so we did not hear what EnviroServ had to say in that meeting. Lauren Johnson, director of the NPC, Sandile Bele an interested and affected party from the community of Dassenhoek, and the NPC attorneys, Charmane Nel of Macgregor Erasmus, spent the two hours allocated making representations, giving voice to the physical and psychological health impacts EnviroServ’s breaches continue to have on members of affected communities, and setting out its legal grounds as to why we believe the DEA has no choice but to revoke or suspend the license. We are optimistic that the DEA will revoke, or at a minimum suspend, EnviroServ’s license, which will be next big step in addressing the pollution which we understand has now reached as far as the communities of Westmead, Pinetown and Westville. If the DEA does suspend or revoke EnviroServ’s license it will be able to, and no doubt will, appeal that decision which will have the effect of suspending the DEA’s decision until the appeal has been finalised. 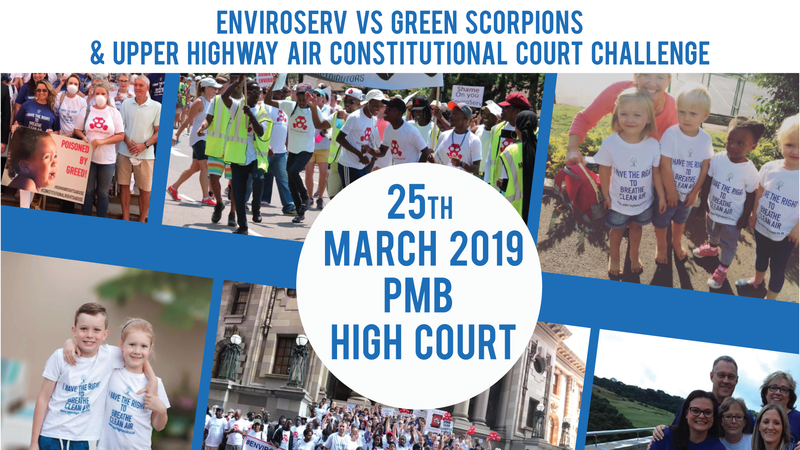 Even after this appeal, EnviroServ has the right to approach the Court to review any decision made by the appeal authority, however, if the appeal fails, then the decision to revoke or suspend will ordinarily remain in force while the review application is progressing. The NPC will take the necessary steps in any ensuing processes to ensure the communities’ voices are heard and that any favourable decision to suspend or revoke is upheld and enforced. Alongside the administrative action taken by the DEA, the NPC is progressing its own formal steps in the fight. Lastly, to Dean Thompson, CEO of EnviroServ, on 18 August 2016 in a meeting with the committee now heading the NPC, you said if they thought the community was going to shut EnviroServ down, they should “bring the fight on”.